Desktop gaming is absolutely the best option for those who love graphics, speed, customizability, and precise controls. Yet desktop gaming has always had one major downside that laptops and consoles overcome. Wi-Fi. Traditionally most desktop computers lack any sort of wireless technology. Things have slowly been changing though as adapters have greatly increased in quality. Modern companies are creating wireless adapters that compete on the same level as corded connections. These days it is far easier to get your desktop computer up and running Wireless technology with a simple Wi-Fi adapter. Just one small USB or PCIe device and you can easily stream to nearby devices such as Smart TV, put your gaming rig in an area without messy cords, and even add portable wireless functionality to different devices anywhere you go. The adapter of today can get blazing fast signal without the huge lag spikes of yesterday’s technology. We’ve created this guide to walk you through the best wireless adapters of 2019. Whether it’s a USB dongle or an internal desktop card, you’ll find our list has a card for everyone and focuses on what matters most to you. Gaming. We understand that wireless technology can be overwhelming to the average person. So If you don’t really understand how to pick out a good card, skip on down to our buying guide and we’ll teach you the ins and outs of wireless adapters. If you’ll already know what you are getting into though, hop on down and find yourself the adapter of your dreams! Plenty fast for gaming and it won't break the bank. The AC3100 is great if you can fit an internal card into your setup. This card is a beast and offers all the top-notch Wi-Fi features you could desire in a consumer level card. It won’t break the bank but it will give you the chance to use all the latest and greatest Wi-Fi technologies. 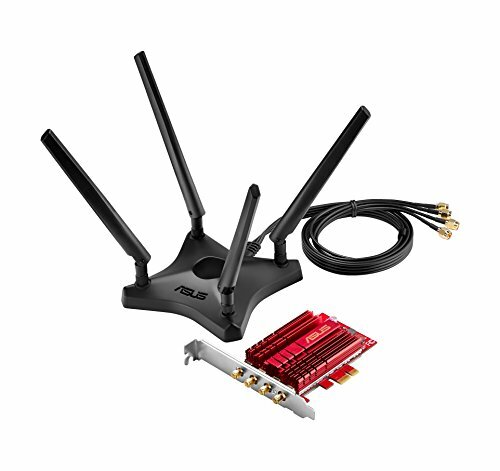 It is part of the AC3100 line by Asus, leaps and bounds above the more common AC1900 found in most Wi-Fi adapters. With 4 dedicated antennae, the Asus PCE-88 offers a range you’ll love and speeds that rival high-quality corded connections. In short, this won’t be your bottleneck if you ever experience lag issues. The PCE-88 also doubles as a fantastic extender because it is powerful enough to take in Wi-Fi and connect with other devices without a hiccup. Wireless cards used to be prone to overheating. Most adapters on this list have solved the heat problems with the addition of heatsinks. The PCE-88 is no different, it’ll operate at a low temperature as long as your case isn’t running extremely hot itself. This is more impressive because it is a powerful card and doing a bit more work than other competitors. All the trimmings of modern technology are offered with the PCE-88. MU-MIMO. Beamforming. The antennae setup is also really simple yet very powerful. Simply place the connected extension piece where you desire and it’ll do the rest. For those tinkerers, one of the unique features on this adapter is the ability to swap antenna out with an array of compatible devices. Some using networking technology for study or expanding upon certain unique versions of software (DD-WRT routers for instance) can use this feature to get a bit more life from their adapter. You can even put the antenna on the card directly if you don’t like using the added extension piece. Just be forewarned it will most likely lower the range and speed due to interference. Albeit not dramatically. There aren’t many cons to the PCE-88. It’s one of the more expensive models out there but still quite reasonable because Wi-Fi adapters aren’t very expensive to begin with. So the cons are almost non-existent. You are just getting a great product when you pick up the PCE-88. It does take up a PCIe spot but most motherboards are equipped to deal with that without much of an issue and ASUS even has a slightly downgraded version if that’s the deciding factor. Overall, it’s just an amazing device with hardly anything to dislike. That’s why we selected the PCE-88 as our FAVORITE Wi-Fi adapter on the market! Solid design and 3 antennas that give quite a bit of range for the money, the Rosewill is a great choice if you are on a tighter budget. Rosewill isn’t well known in the consumer internet community but they’ve produced a fantastic product at a very competitive price with the RNX-AC1900PCE. With Dual-Band 802.11ac wireless signals, the RNX performs admirably in any modern gaming desktop getting the speeds you need to be in control. Using three antennae, Rosewill offers the mainline features you’d expect from a dedicated internet peripheral designer despite being pretty unknown in the market. We loved the no-frills solid design of the RNX-AC1900PCE. It’s a mid-range card budget wise that offers top-notch speeds, nice components, and solid design. As we’ve said repeatedly, we’re big fans of technology like MU-MIMO and Beamforming tech. The RNX-AC1900PCE takes full advantage of all these features meaning that you will have great wireless support. A card like this can easily handle being connected to 5 or 6 devices simultaneously without overheating or being overworked. The heat sink itself is pretty serious on the RNX model. As we mentioned earlier cheaper Wi-Fi adapters tend to overheat after hours of usage or at best contribute to the overall rise in desktop temperature. This card is slightly less powerful than the PCE-88 but it doesn’t cost as much either so it fills a pretty competitive niche in the Wi-Fi adapter market. Our biggest con is that the years of wireless focused product development you’d find at a company like Netgear or D-Link simply isn’t there with Rosewill. 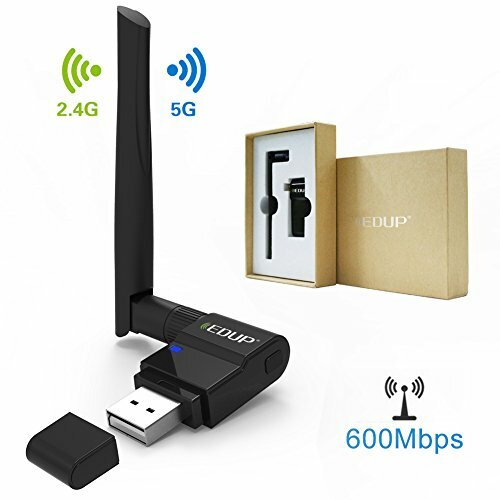 They offer a fantastic product and did a great job with this item but there is no guarantee that they’ll offer long-term support compared to other wireless companies. This is mostly due to Rosewill being a jack-of-all-trades in the peripheral market. Despite this drawback, if you want a great value with top-notch quality, the RNX does a splendid job. Great for Micro-ATX builds and builds that don't have any funds to spare. If you have the budget though, we recommend one of the two internal adapters above. The TP-Link T6E is a standard two antennae internal Wireless card. Where it stands out from the competition is the quality of components at this price range. It also has a big brother card that pumps up the features, adding beamforming technology and a faster speed at a price premium. If you love TP-Link the big brother device is a great option but unfortunately doesn’t do as well as other devices in that price range, so we selected the more modest T6E. The T6E is starting to be at lower end for speed with the modern 802.11ac format but still does extremely well when gaming. It may be just slow enough to push players of highly competitive twitch shooters such as CS:GO away but the speeds are more than enough for downloading and playing any games where a little bit of lag is acceptable (Such as MMO games or even some MOBA games). We tried to select adapters with excellent heatsinks for this list since budget PCIe cards suffer from issues with overheating, so like other options the T6E has invested a large amount of space to high-quality heatsinks. Rather than struggling through heavy loads, you can stream to multiple devices and do large data transfers without running into issues with quality. Beyond that it’s a simple PCIe card with enough power to game without noticeable lag.Obviously this isn’t the best card on the market but for this price you’ll end up with a piece of technology good enough for a variety of Wi-Fi uses. The elephant in the room is, “Why would I get this card for a PCIe slot if just a little more money can get me a big boost in quality?” We can comfortably answer that with the niche that this card falls into. The card is great for Micro-Atx builds and budget desktops, ESPECIALLY if they are mobile. It’s a tiny card and does a fantastic job despite being modest in quality. If you really you want MU-MIMO, beamforming, a speed boost to 1900Mbps, and an extra antennae, consider the T9E as well but we would also recommend the Rosewill option in that price range. 1-4 antennas available depending on what you need. A bit bulky, but provides an excellent option if you need to add WiFi via USB. The TEW-809UB is one of the bulkiest USB adapters on the market because it packs quite the punch. TRENDnet isn’t playing around with the TEW-809UB, as it looks less like a traditional adapter and more like a miniature dedicated router. That’s because the TEW-809UB doesn’t compromise on the any of the basics. With four dedicated antennae, a decently weighted stand, and decent speed, you can rely on the TEW-809UB to be your go-to mobile Wi-Fi solution. We especially like the form factor if you plan on using this to extend household internet signals. The reason primarily being that the stellar design also makes anyone who sees it subconsciously assume the 809UB is a router. That means no one fiddles with the USB adapter and moves it around and it also means users will expect to get good service around this device (Which they will). The design is absolutely in line with the intended use. Despite being a bulky device, there is a slight amount of wiggle room. If it needs to be placed in a more complicated area, each antenna is detachable. That means this little device can slim down quite a bit on one side and snuggly fit up against a wall or in a corner. It still is larger than most devices on this list though so you should expect to clear some space for it. It keeps good heat, gives great service, and offers everything you need in a modern adapter. One con that unfortunately is hard to test with many products is the compatibility range. This device doesn’t seem very OSX friendly so we would be wary of expecting it to work with some modern Apple devices (The Wi-Fi will be receivable by any device but it may not be able to connect by USB to a modern MacBook Pro). Generally Apple products aren’t used for gaming and have great onboard Wi-Fi but it is worth noting that it might not be compatible if you plan to plug this into a modern MacBook for use as a Wi-Fi extender or something else. It’s wise to reach out to TRENDnet or read some reviews from modern Mac users if you plan on doing that. Small footprint from a brand that is synonymous with networking gear. Definitely check this one out if you are looking to add WiFi without a lot of bulk. Netgear has been creating high-quality routers and wireless products over the last few years that consistently rank as the best. The A7000 Wi-FI adapter is no different. With small footprint and an interesting form factor, this USB Wi-Fi adapter looks sharp and performs extremely well. Many connections that rate at 1300Mbps are unfortunately bottlenecked by the ISP long before the adapter so you can often expect your internet to stream as fast as your system can take it. There are theoretically faster adapters but it’s unclear on a broad-scale how tangible that difference is with mid-range products. 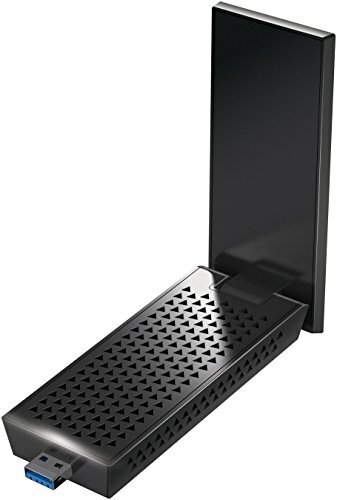 We love Netgear for its Nighthawk router and they’ve gone the extra mile making it easy to sink and connect with this USB and also add it to your collection of Wi-Fi extending devices. Despite the humble look, it is a pretty powerful Wi-Fi adapter. The form factor is small so it can fit behind your desktop quite easily. It also doesn’t waste power or cause huge issues with heat. Just a solid portable solution to Wi-Fi. It probably is the best “Flash Drive” style adapter you’ll find as most adapters of this quality start to add specially dedicated antennae racks. Like most adapters it is possible to use a magnetic stand and get a more projected quality with this as well. We have been consistently impressed with the products coming out from Netgear and this drive is no different. Solid, quick, and VERY easy to use (Just pull it out of your pocket and plug it in). It has a similar niche to the EDUP while also allowing fast streaming and decent gaming speeds. So what’s not to like? The biggest drawback is probably just a form factor preference. Great quality, great design, fantastic price. It’s the plug and play adapter you want to own but it will ultimately always be a USB stick. That’s not a huge negative, just something to consider if you wanted a more permanent feeling solution or something of a talking piece like the DWA-192. Easy and quick internet access with a small dual-frequency antenna. EDUP has created a popular little device here that does one thing and one thing well. Quick and easy internet access. There are no frills and a single large antenna (That may technical contain two as it is dual-band) with this USB device. It’ll get decent speeds when close to a router but it isn’t designed to be streaming through large walls or great distances. The EDUP adapter won’t be a good router extender or a life-changing “Gaming adapter” either. That’s not really the intended design though. This little device gets you up and running when a corded setup is unrealistic, unavailable, or too much work to use. The very low cost adds a completely different aspect to this USB device as well. Since it does offer a decent level of internet quality on a very low-budget, this is the little piece of technology you want handy for all the events life throws at you. For instance, it is great in an office to add a bit of Wi-Fi to an older desktop. It’s fantastic for a big move where you may not be able to set up internet close to a desktop computer without a bit more time. It’s great for simply popping online, unlocking all your annoying DRM settings, and then getting in the game. You can game with it, download, and even stream Netflix or Youtube. If you have a big download, leave it on at night and it’ll do all the work. Gaming you’ll notice the ping occasionally hitting above 120 with a good ISP, and it is especially noticeable with the additional strain of a poor ISP or distance from your router. With a hotspot though and this handy cheap device, you can add Wi-FI to any compatible device through a USB port and that’s handy to have! The biggest con with EDUP’s flagship budget model is going to be speed and the no-frills design. Technically whenever a model uses a speed such as 600Mbps, the actual speed is slower. Since EDUP is using a very small adapter space and it’s a budget model, you won’t be remotely competing with more advanced adapters. Still there is a great niche for this as a handy tool to have on hand. You’ll definitely want something more powerful though if you have a good setup, a nice gaming desktop, or want to use the internet in large doses. Dual band a a bit better signal range than some of the other options. Check it out if you like the non-standard form factor. 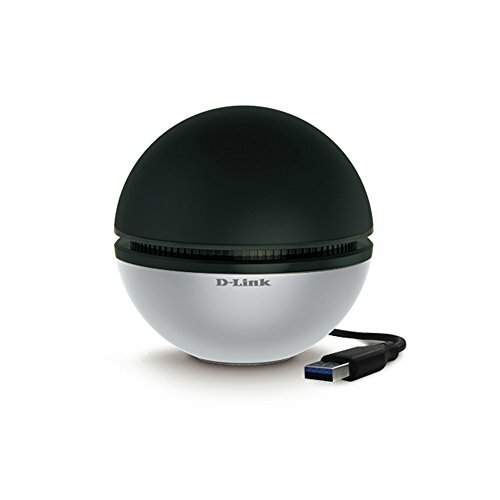 D-Link has created one of the most unique looking USB Wireless adapters on the market with the sleek spherical design of the DWA-192. Whether you are a fan of the pokeballesque format or not, the DWA-192 sits comfortably on a desk and easily connects to other D-Link devices (Such as a gaming router) to extend Wi-Fi. You wouldn’t even realize that it is an adapter at first. Despite the strange shape it does internally have 3x3 antennae with implicit beamforming. That means the beamforming will work with any device and the DWA-192 uses this to great effect. D-Link claims that the DWA-192 is a perfect addition for extending signal because it can use power to amp up the signal. That means concrete walls are far less obfuscating and your signal won’t get blocked going from room to room. In most testing situation it was actually considerably better than the competitors. Whatever they have done minimizes signal loss by a noticeable margin, preserving significant amounts of speed. It’s a mixture of power management, device quality, and beamforming but it works. The DWA-192 is perhaps the most unique device on this list but also the best option for getting that router to connect between two floors. So what’s not to like? First, the shape looks great and is very mobile but it might annoy some users that they need to place a sphere on the desk. It isn’t exactly low-key. Secondly, the USB cord that it comes with is a bit shorter than what you’d desire so make sure to buy a longer cord if you plan on having this stretched across a desk or put a bit further away from your desktop computer. It’s a solid device though and fits in especially great with one of the D-link gaming routers that we selected in our guide on the best gaming routers of 2018. Internet is one of the simplest yet most crucial aspects of a modern desktop computer. Without solid internet you lack the ability to stream content, play multiplayer titles, or even boot-up several AAA single-player titles now relying on DRM or Publisher Launching Applications. Besides the fun aspects of the internet, reliable Wi-Fi allows you to work uninhibited and keep your desktop running smooth. If you have good internet, you rarely think about it. If you have poor internet though, you ALWAYS thinks about it. And unfortunately it’s not always easy to connect a desktop to the internet. Sometimes the way an older house is wired requires forces gamers to string long ethernet cords across walkways and ceilings. Little handicaps like that keep your desktop tied close to the router, meaning that dream office is unobtainable or the your computer ends up in an awkward location such as the kitchen. It can be so obnoxious gamers just elect to use a laptop and get an inferior experience. That is why a Wi-Fi adapter IS your best friend for good reliable internet. Why do I need wireless for my desktop computer? Wireless adapters come in a variety of formats. The most common are external USB connected adapters. These may plug directly into a USB slot and stick out a little bit or be connected by a USB cable that links to a larger device. These larger devices often have multiple antennae and are more powerful than the simplistic USB dongles. The other format is as an internal wireless card that plugs directly into a PCIe slot. These cards tend to be the most powerful, including antenna that stick out the back of the case. Some even include an antenna extender that can be used for putting them in a more useful location. Whatever the form factor is, it greatly affects the adapter you get. You’ll often see AC1900 or AC3100. The first two letters mean that the model is using the 802.11ac networking standard (Elaborated on later). The number represents the theoretical bandwidth which is often either the maximum of one specific band OR the maximum of a combination of bands. Speed fluctuates greatly between Wi-FI adapters and is most commonly measured in Mbps. The Mbps is purely theoretical and rarely close to accurate. In fact most ISP providers don’t offer internet at the top speeds theoretically available anyways, at least for the consumer market. Still, a higher speed is the best option and there is an array of benefits to getting a speedy Wi-Fi adapter. For instance, higher speed adapters usually can connect to more devices without being slowed down as much as lower Mbps devices. This is because the speed is often split between devices. Secondly, you may simply want to connect between devices directly rather than focusing on internet itself. A high Mbps means that you can transfer files at amazing speeds from computer to device. Wi-Fi adapters are no good if they lack the range to acquire a signal. Most adapters offer a decent range but the best quality adapters will usually go significantly further. Others like the DWA-192 are designed to actually boost signals so that Wi-Fi blocking materials such as concrete walls are easier to pass through. Consider how far you’ll be from the router when purchasing a Wi-Fi adapter. You may want one that doubles as a signal extender as well. Most Wi-Fi adapters neglect to state the specific range so it’s important to do research and even read a variety of reviews before making a purchase. Old laptops relied on external wireless cards long before the modern internal card was created. These old external cards are incredibly slow and often run on an older internet standard. Today’s modern technology has heavily improved all around when it comes to wireless signals. Our list is relatively recent but be forewarned not to go for older devices or those that offer extremely slow speeds such as 150Mbps. They often are more of a frustration than it’s worth dealing with. Realistically any device created before 2013 should be avoided as it will use an outdated networking standard. There is also a good chance that devices beyond 3 or 4 years of age will have large compatibility issues. Usually this doesn’t affect Wi-FI but can affect the other features such as Beamforming or onboard software compatibility. The best adapters will be internal and can rival corded setup speeds. These may be tiny or fill a whole PCI-E slot. Overall expect better speed and a lot more power with an internal card. The downside is that internal cards aren’t mobile by any means. External Wi-Fi adapters can often be plugged into a device and then removed and inserted into another device on the fly. They’re very convenient for adding Wireless abilities to various devices on the go. Multi-User Multi-Input Multi-output or MU-MIMO, the far simpler acronym, is a modern wireless technology that greatly increases the quality of wireless signals when using multiple devices. Before MU-MIMO technology, routers would switch rapidly between devices to offer signal. This simulates real-time but often isn’t true real-time. In fact connecting more than 3 or 4 devices can heavily slow down a connection that lacks MU-MIMO. MU-MIMO streams data in real-time to multiple devices without slowing down the connection. It’s a huge improvement and would most likely be useful for a desktop computer user who enjoys streaming, connecting Alexa or other smart devices, and using the full array of Wireless features that a card offers. Normally wireless signal is transmitted in an unfocused form, bouncing out from the source of the signal in circular waves. This wastes a lot of resources as well as makes disconnecting from a source more likely. Beamforming is an elegant solution that heavily improves on the distribution of signal between router and device. When a device connects to a wireless signal, it creates a direct focused beam with higher energy use rather than spending all that time pumping waves out. Beamforming is newer technology and most devices need to be compatible with each other in order to take advantage of beamforming. Newer technology does offer what is known as implicit beamforming though, a form that adapts to older devices and allows them to take full advantage of beamforming. Companies normally reference implicit beamforming with in-house terms such “advanced beamforming” or “beamforming+” when advertising. Beamforming devices require MIMO support.
) being introduced two decades ago. The newest 802.11 format (802.11ac) was introduced in 2013 and is far faster and superior to the original format. All 802.11 formats are compatible so that means an older router will work fine with a newer device. The downside is that the benefits from newer wireless standards are reduced to the lowest quality device in the chain. So buying a fancy, up to date wireless adapter may actually be held back by the junky router you own. The speed benefit is great though, for instance the 802.11ac format is theoretically three times as fast as the 802.11n format meaning older standards such as 802.11a can feel abysmally slow these days. There are MANY formats but only a few are used commonly enough to be relevant. Always buy a PCIe card with heatsinks. It just makes a huge difference and keeps your case from turning into an inferno. USB devices are less prone to overheating but as a rule of thumb, cheaper devices will sometimes experience strain that expensive adapters usually don’t. Wi-Fi adapters usually have small drivers (Onboard software that directs the hardware on how to run) and install automatically when plugged in. Rarely a compatibility issue might occur between specific OS. Check to make sure it will work with your OS, especially Apple users. Wi-Fi adapters are not a super complex technology. At least what you need isn’t complex. Networking involves so much that IT professionals train for decades to understand all the ins and outs of networking. Yet the average user will hardly need to consider much more than the features we listed above. You don’t need fancy high-concept features to make you game and stream smoothly. Generally with good speed, newer parts, low heat output, and good service. It’ll work out very well. Power users may want some different features we don’t really cover on this list but unless you are attempting to become a CCNA or entering into the IT industry, most features will be at best useless to the average person beyond what we listed here. Bottlenecks are the point where data is held up or slowed down in a computer setup. These can occur all across various system setups and unfortunately are hard to diagnose without a bit of tech savvy. For instance, a common overlooked bottleneck is pairing a low-quality router with a high-quality modem. Another common bottleneck is using an older 802.11 standard with a newer device. In this case the older quality 802.11 standard will be used for both devices causing a large drop in speed. As we explain later on, this and other similar problems can greatly affect your internet connection. So make sure to check for common hardware bottlenecks first such as the router, modem, connection format (USB 2.0 vs 3.0, SATA III vs SATA), or adapter quality. How do I find my bottlenecks? Ideally when looking for problems with your wireless setup, find the weakest link in the chain. This starts with your ISP. Your ISP is the base bottleneck as it represents the maximum obtainable internet speed. Even if you have the best components, slow ISP signals will still be a problem. After checking out the ISP, investigate your hardware from modem to wireless adapter, marking down any bottlenecks. Have an old router that is 802.11g but want a top-notch 802.11ac wireless adapter? Unfortunately you need to replace the router first. Unless you plan on moving the desktop around to areas with better wireless standards, the new adapter will always be held back. Standards like USB 3.0 and PCIe are so fast that they aren’t the cause of bottlenecks, but older formats such as the ancient USB 1.0 format are technically too slow to handle all the data modern components can throw at it. 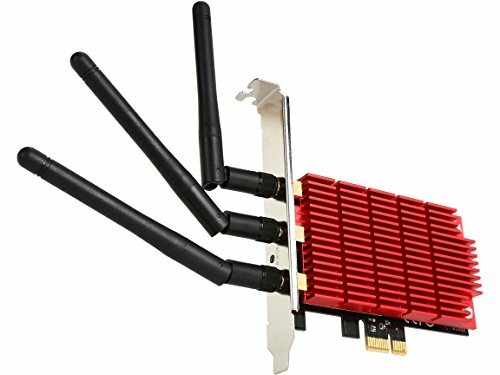 How do I set up a wireless adapter? Wireless adapters are most of the time simple plug and play devices that use a USB port or internal wireless cards requiring a PCI slot or in newer motherboards an m.2 slot. Some motherboards even claim to have onboard wifi but it is most likely a separate card that has been attached or even soldered into place. Wireless adapters often use simple drivers that set the product up quickly and run like the wireless feature on a laptop or smartphone. Some will use unique onboard software but this rarely adds anything that the Windows 10 software won’t already be adding. Is corded always a better solution? Until recently wi-fi signals have been pretty pathetic in comparison to a corded setup but that gap has slowly been shrinking. Due to consistency and quality they are universally appraised as better but a great wireless card will run fast enough to make the difference negligible. In most cases the speed of internet itself is a larger choke point before the wireless adapter (As modern internet speeds rarely surpass 300mbps in most homes). The more important factors are usually range and reliability because a good adapter can still fall prey to a poor location or setup. Consider too that older wireless cards in desktop computers can be an additional choke point as well. The RJ45 jack format (Ethernet) has been around for years and some older ethernet cards are still very slow compared to a modern top-notch motherboards onboard system. Because of this, a USB or internal wireless card may still be an upgrade over corded solutions as well. Some motherboards, particularly the last two chipset generations, already have Wi-Fi capability incorporated into the motherboard. Preferences are different depending on the piece of equipment and manufacturer so due diligence is recommended when researching motherboards. 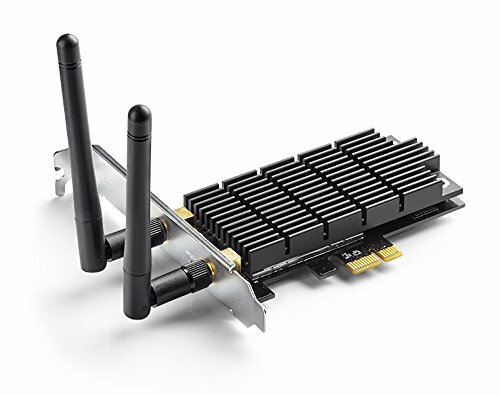 In general, separate PCIe and USB wireless adapters significantly outperform the majority of pre-installed cards found on modern motherboards..
What are the benefits of an internal wireless card? Internal wireless cards require an open M.2 or PCIe slot but tend to be faster, more functional, and offer more antenna. They also don’t have the same drawbacks when it comes to connection issues because USB ports can sometimes become loose over time. This is especially annoying with a wireless adapter because every slight deviation can install new drivers and waste several minutes to boot back up. An internal card will run flawlessly every time as long as the internal computer components are error free. Solutions like M.2 are insanely fast in connecting between the card and your motherboard but naturally limited due to the inability to send a Wi-Fi signal outside the case easily without external antenna and more. This is why most PCIe cards will have a large extension on the back or even connect to an external piece of equipment through the back of PCIe card. What are the benefits of an external wireless adapters? The biggest benefit is the plug and play nature offered by external wireless adapters. They come in a variety of forms, some tiny and quick to switch between devices. Others are full-size devices that simply sit somewhere on the desk while wired into the computer. If you need to move around a lot or simply need wireless only from time to time, external adapters are a cheap and effective solution. How important is my router for gaming? Very important! Your router dictates how many devices can comfortably be connected, how much bandwidth is allocated, and is the first chokepoint to speed you’ll come across when setting up a wireless device. We’ve written extensively about routers in our guide to the best gaming routers of 2019 where you can learn all you need to know about how routers impact your internet quality. Consider this as the first priority when seeking an internet upgrade. What about Wi-Fi adapter software? Realistically some Wi-Fi adapters tout advanced software but the most important features for power users are rarely found on the adapter itself. Instead features like QoS are standardized with high-quality routing gear. The most important software you can have would be a VPN for security or a comparable Firewall. Realistically the onboard windows Firewall and security systems are amazing compared to just a few years ago and would protect the vast majority of users from various security flaws. The other software you may want would be used to transfer files, network appropriately, stream to devices, or extend Wi-Fi using the adapter. 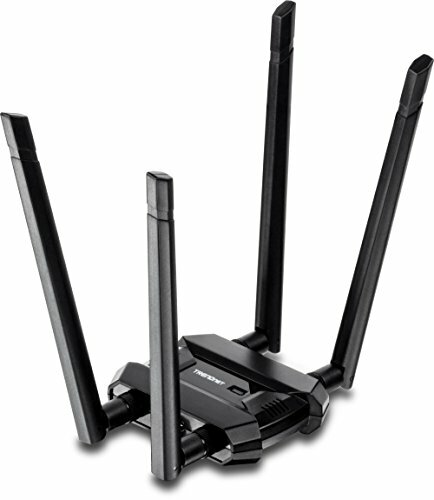 Most routers cater to these things though if that is a realistic option for your setup. What else should I consider when thinking about a Wi-Fi adapter? Clear your bottlenecks and check the range of your router. It’s wise to investigate those two things before making a purchase as a new adapter won’t solve the issues presented from an outdated modem or ISP. To investigate the ISP, simply check your internet speed using an online speed test. These can be found from a variety of online sites or provided by your Internet Service Provider. Keep in mind that there is never a need to pay for an online speed test. Websites that say otherwise are trying to scam you out of money. It’s important to see if you are getting speeds close to or near what has been advertised by your ISP. If that’s not the case, make sure to give them a call and discuss it! Often an outside issue such as a faulty wire or poor neighborhood setup may have gone unnoticed and many companies will send someone out to fix or work through your problem. This is the first step in seeing if you have Wi-Fi problems and a great adapter will remain useless with poor ISP service. Afterwards check your router/modem. It’s common for routers to be using an older 802.11(x) standard so it’s important to consider an upgrade to 802.11ac before moving on. After those two bottlenecks are cleared you can do a range test. Simply test your Wi-Fi using a non-corded device such as a smartphone both near the router and far enough out to notice a dip in service. If your wireless connection is running on 3 bars or less, you are at the maximum distance for your router. With this information you’ll know if you need to fix any problems before getting an adapter AND get a good idea of the range of the router you are using for a semi-modern device. Remember that Wi-Fi cards are not equal though and a good laptop may get a much stronger signal than a poor quality one so you may want to range test with several devices. With this knowledge you now know if you need to get a Wi-Fi extender, a higher end adapter, or even replace your router. Whether it’s looking at the latest Cat memes or fragging people in Doom Eternal, The internet is a blast to use and nothing is worse than slogging through poor quality Wi-Fi. We use that glorious wi-fi for everything now, especially for gaming, streaming, and killing time. These adapters were picked because we want you to be able to game without frustration and with a smooth silky connection! We hope you’ve learned something from this article and found some new gear for your rig. If you’ve learned something, found a favorite product, or think we missed something, leave us a comment below! And as always, keep checking back for more articles on the latest gaming gear that you’ll fall in love with!